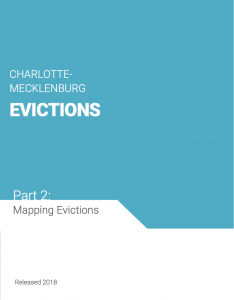 The UNC Charlotte Urban Institute and Mecklenburg County Community Support Services released Charlotte-Mecklenburg Evictions Part 2: Mapping Evictions Tuesday, March 20, 2018. Evictions Part 2: Mapping Evictions is the second of three reports on the topic and marks the first time local eviction data have been mapped at the neighborhood level. The report shows where formal evictions occur and links eviction data with Quality of Life Explorer data to explore the characteristics of neighborhoods with high and low rates of evictions. Evictions can be formal or informal. Formal evictions involve a legal process in which landlords attempt to regain possession of a premises from a tenant. Informal evictions happen outside of the court system. 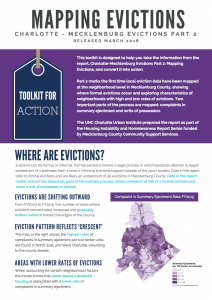 Data in the report refer to formal evictions and are likely an undercount of all evictions in Mecklenburg County. The report maps two parts of the formal eviction process: the location of households in Mecklenburg County who are at risk of formal eviction (received a complaint in summary ejectment) and the location of writs of possession served for households to be removed from the premises (households that did not file an appeal or move within 10 days of receiving the judgment from the magistrate that they have been formally evicted). The analysis of eviction data is organized into three main sections: eviction density, eviction rates and clustering, and neighborhood characteristics. Below is a summary of each section with key findings. Where in Mecklenburg County are the largest concentration of complaints in summary ejectment and writs of possession served each year and how has this changed over time? From FY2003 to FY2015, the number of areas where evictions concentrated increased and gradually shifted outward toward the edges of Mecklenburg County, which could be the result of growth, suburbanization generally, suburbanization of poverty, or increased multi-family housing on the edges of the county. The neighborhoods in Mecklenburg County that have been and continue to be most affected by formal evictions are in East, Northeast, West, and Southwest Charlotte. Which neighborhoods have the highest rates of complaints in summary ejectment and writs of possession served when we account for underlying housing density? Do neighborhoods who have high or low rates of eviction tend to cluster near other neighborhoods with high or low rates? What specific neighborhood characteristics are associated with higher or lower rates of evictions? A neighborhood indicator associated with lower rates of households at risk of formal eviction was the presence of development-based subsidized housing, which decreases housing costs. Through the report, we are able to see a geospatial pattern of evictions in Mecklenburg County in which not all Mecklenburg County residents have access to the same opportunities for long-term housing stability. These spatial patterns echo other patterns related to wealth, education, housing and health that are reflective of a history of policies and practices that have had discriminatory effects and disproportionately impacted households of color and households living in poverty. Although mapping evictions helps us to see the problem better, it also provides insight into possible solutions. Place-based subsidized housing was found to be associated with a lower rate of complaints in summary ejectment, suggesting the role of housing assistance, including subsidies, in stabilizing households and neighborhoods. The third report in the series will provide an analysis of a one-month snapshot of eviction court records from Mecklenburg County. The report is part of the Housing Instability and Homelessness Report Series, which is designed to better equip our community to make data-driven decisions around housing instability and homelessness. The report series was initiated by the Housing Advisory Board of Charlotte-Mecklenburg in 2014.  The UNC Charlotte Urban Institute authors the report series. Funding is provided by Mecklenburg County Community Support Services. All reports are available by clicking here. This post is co-authored by Ashley Williams Clark and Courtney Morton and is accessible on the Charlotte-Mecklenburg Housing & Homelessness Dashboard blog. Courtney Morton is the Housing & Homelessness Research Coordinator for Mecklenburg County Community Support Service. Courtney’s job is to connect data on housing instability, homelessness and affordable housing with stakeholders in the community so that they can use it to drive policy-making, funding allocation and programmatic change.  Mecklenburg County Community Support Services provides funding for the report series.